I wanted to feature the symbol for this 13-day period or Trecena in the Aztec traditions, we are on day 5 of the Flower Trecena which is Lizard (Cuetzpalin) provided with the tonalli (shadow soul) of Huehuecoyotl the trickster Coyote today (8/27) work on your reputation with actions and not words. 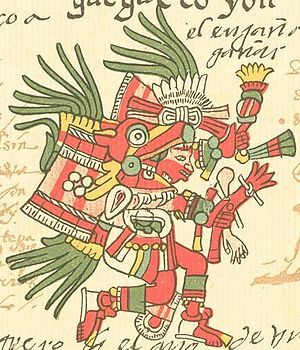 The thirteen day period (trecena) that starts with day 1-Xochitl (Flower) is ruled by Huehuecoyotl, Old Coyote, the Trickster, god of deception. This trecena signifies the sacred role of the jester: revealing the truth of the old ways by treating them as irreverantly as the gods do, the jester treats nothing as sacred and so points out the sacredness of everything. These are 13 days profoundly influenced by creativity and playfulness: music, dance, art and poetry are simply masks worn by the jester to tear away the away the masks of civilization. The trickster-jester-clown is the final mask of human beings: at one with the divine absurdity of the world, the mortal creator moves toward becoming an immortal force of nature. These are good days to make things; bad days to fear what others might think.